How to Lose Weight with Hypothyroidism | Crush Thyroid Problems Now! What is the Whoosh Effect for Weight Loss? Myth or Real? Losing weight can be a frustrating, uphill battle, am I right? And if you have a thyroid that just isn’t functioning properly, you may want to throw in the towel altogether and grab an extra slice of pizza instead. But thyroid problems don’t have to be the death sentence to your weight loss goals. If you suffer from hypothyroidism, then this article is for you. With the information and tips you’ll find here, you can get your metabolism in gear and finally tackle weight loss effectively. Put your thyroid to work for you and learn to combat the symptoms of hypothyroidism effectively. In the simplest terms, hypothyroidism means you have an underactive thyroid. But if you don’t know exactly what the thyroid does, then this definition doesn’t help much. So, let’s look at the job description of your thyroid. The thyroid is a small gland that releases hormones to keep your body working like a well-oiled machine. It regulates all sorts of things – from your body’s temperature to appetite to energy – it’s a very busy bee! But the brain (by way of the pituitary gland) is what tells the thyroid to get to work by using TSH – the thyroid-stimulating hormone. If your TSH levels are thrown off, then your thyroid is either working overtime (hyperthyroidism) or snoozing on the job (hypothyroidism). Do any of these symptoms sound familiar? You’re not alone. It’s estimated that more than half of the people in the world who suffer from thyroid issues have no idea! If you think you might be one of those people, consult your doctor for a quick and easy blood test. Poor diet, food sensitivity, soy and gluten. Several of these factors are totally (or almost totally) in your control – this is good news! To figure out how to lose weight with hypothyroidism, you need to address those things that you CAN control: your dietary lifestyle, exercise, and stress levels. It’s important to note that the only way to properly deal with hypothyroidism is through medication, which gets your hormones back on track. However, your lifestyle choices can give your body the boost it needs to better manage hypothyroidism and its symptoms. It’s no surprise that your diet affects basically every functioning system in your body, including your hormones and, you guessed it, your thyroid. So, it’s important to eat foods that give you the nutrition you need and avoid foods that throw your hormones for a loop. There are several essential ingredients that you need in your diet to help combat hypothyroidism and its negative effects on your body and weight. Here are some key foods to include in your diet. That long list of foods may seem overwhelming – however, you can also supplement with natural remedies to give your body it’s best chance to fight back against hypothyroidism. Wholesome food is always the number one recommended choice. If you believe you may have hypothyroidism or would like to lose weight faster using a natural supplement that supports your thyroid function. I highly recommend T432 Plus from ATP Science, a potent, natural supplement that combines zinc, selenium, iodine and other supporting nutrients that will support your thyroid function and fire up your metabolism to lose fat and regain control of your health. 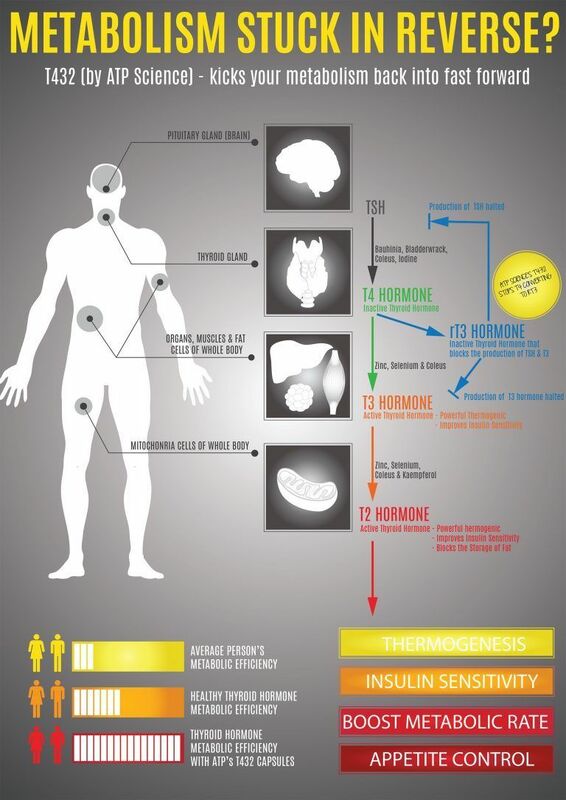 To read the full ingredient list and the scientific break down on how T432 Plus supports the thyroid hormone for fat loss click here. Ashwagandha is another very powerful, natural remedy that helps you deal with stress and can work wonders in treating your thyroid condition. To learn more about how this adaptogen herb helps you combat stress, check out this article. On the flip side, there are some foods that you want to reduce or avoid completely. For example, too much sugar in your diet can disrupt your body’s hormone balance. Foods that include refined flour as a main ingredient can also negatively impact your hormone levels and lead to weight gain. Getting your body moving plays a huge role in helping you manage your hypothyroidism. Not only does regular exercise help you lose weight, it also helps with depression and fatigue – both common complaints when dealing with an underactive thyroid. Exercise is also a great way to deal with stress, which I’ll discuss in the next section. So, hit the gym regularly to fire up your metabolism and tell hypothyroidism to take a backseat to your goals. If you’re suffering from extreme physical or emotional stress, then your stress hormones are coursing through your body at very high levels. This does a ton of damage to your body, including suppressing or damaging the thyroid gland. To keep your body (and your thyroid) working smoothly, tackle the root cause of your stress. Aim for at least seven hours of sleep every night, incorporate meditation into your daily routine, and exercise regularly to release pent-up stress. Not only will reducing stress help your thyroid do its job, it will also help balance the cortisol in your body, which can boost your weight loss. If your thyroid is sleeping on the job, give it a wake-up call! By combining medication with the tips and supplements in this article, you can jump-start your weight loss just as effectively as someone with a normally functioning thyroid. Take control of your own health and happiness and don’t let your thyroid dictate your success. With over 10 years of healthy lifestyle experience, I've dedicated a website with useful information on health, fitness, home gyms and much more to breakdown those barriers towards reaching your goals. Copyright 2019 by ExerciseWithStyle.com. IMPORTANT: For your information only. Exercise With Style does not provide medical or nutritional advice, treatment or diagnosis. This website is a participant in the Amazon Services LLC Associates Program, an affiliate advertising program designed to provide a means for sites to earn advertising fees by advertising and linking to amazon.com. Amazon and the Amazon logo are trademarks of Amazon.com, Inc. or its affiliates.